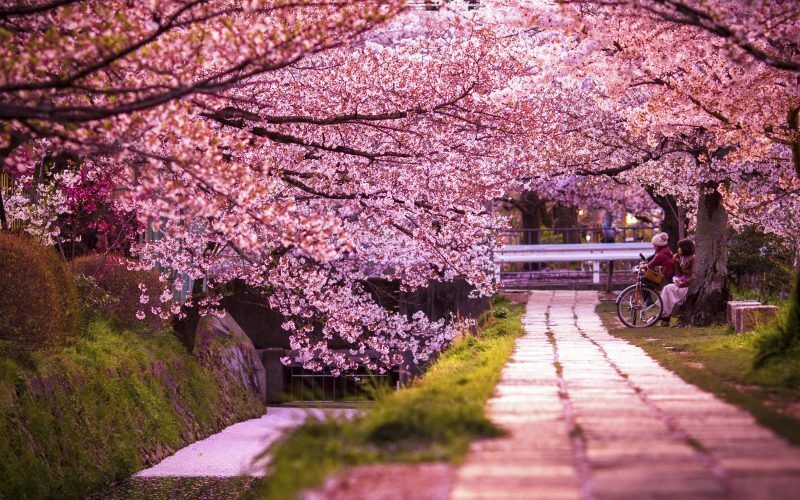 Follow the path to riches through 10,000 vermillion torii gates. Known for its thousands of blazing vermillion torii gates, the Fushimi Inari Shrine draws visitors up and around its winding trail to worship the Shinto god Inari, the “kami” of rice and harvest – more commonly revered for bringing in those blessed dollar dollar bills. 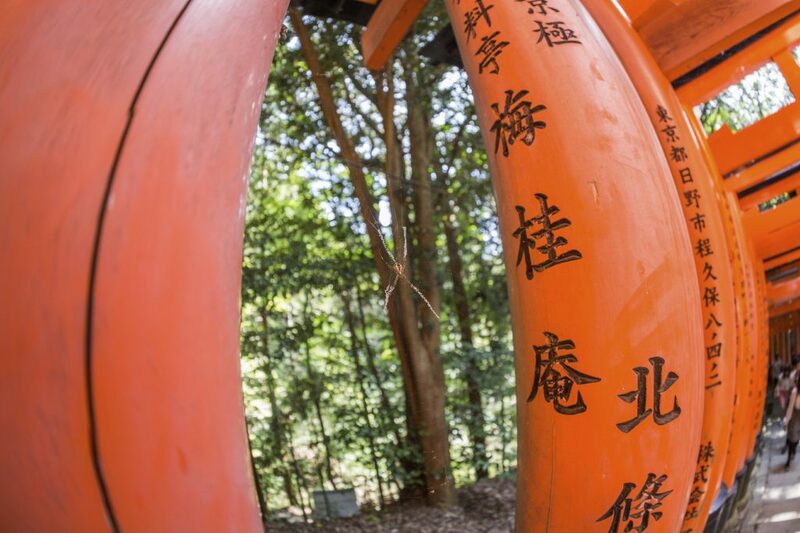 The names of individuals, businesses and celebrities are inscribed on the pillars of the torii gates. 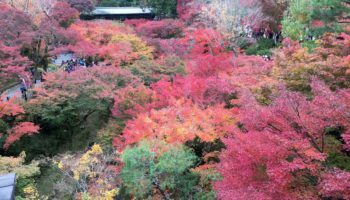 While foxes are believed to be Inari’s messengers at this sacred spot, don’t be surprised when you discover the names of businesses inscribed along the torii tunnel weaving a sprawling labyrinth up the mountain. 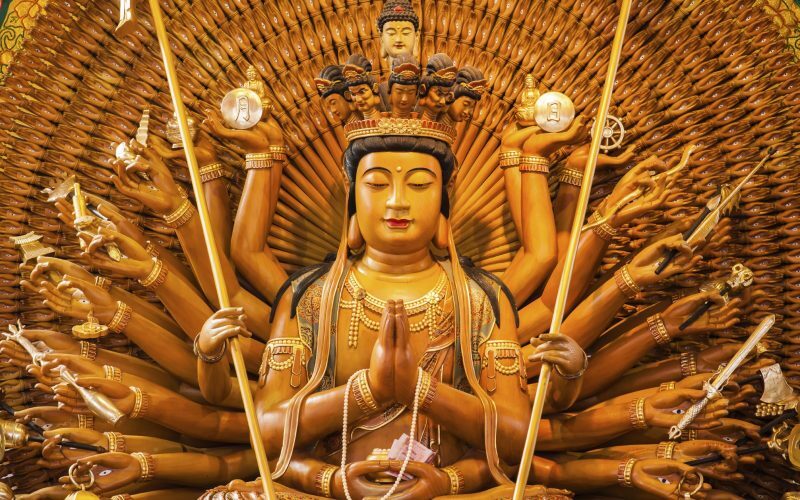 To ensure good fortune in the future, heaps of companies and individuals—not to mention some big name enterprises and celebrities—make an offering of a torii gate that are currently available for public purchase. 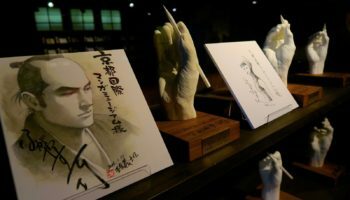 Prices are a snip at ¥400,000. 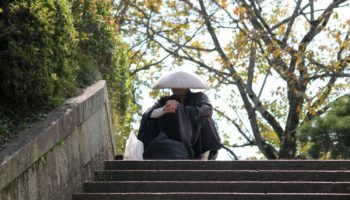 You’ll spot dignified fox guardians aligning the cobblestone steps spanning more than four kilometers across the wooded Mount Inari. These stone-carved foxes are unique because they replace the common guardian lion-dogs (komainu) that serve as a classical feature of Shinto shrines. Lucky little (and big) fox statues are on display throughout the shrine. It takes around two hours to reach the summit of the mountain and one hour to get back down again. Tiny restaurants dotted around the trails offer tea and local snacks, including ‘Fox udon’, pointing the way to a small shrine at the top where you can pray for a bit of extra cash flow (or enormous wealth depending on how bold you’re feeling). Happily you don’t have to cash out thousands of yen to be granted a wealth of happiness. Daytrippers can buy smaller ornamental sized gates to be placed among the myriad of moss-ridden altars and sub-shrines throughout the area. 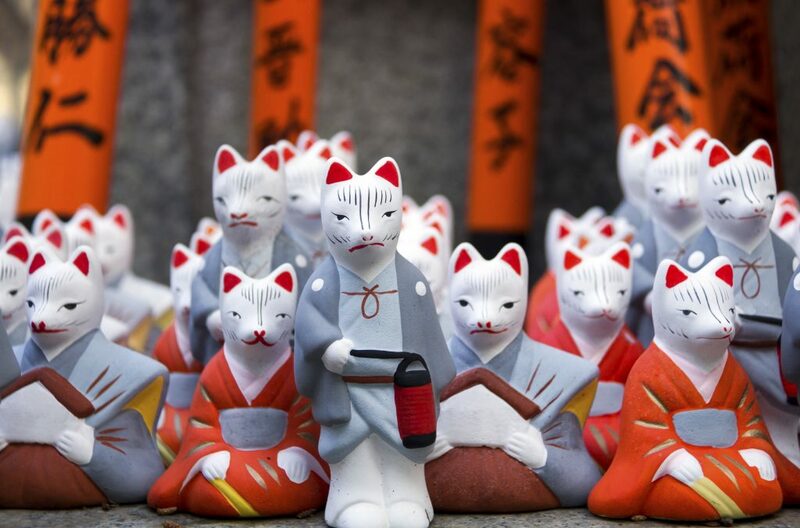 *Added bonus: Fushimi Inari Shrine is accessible 24 hours, free of charge, for all visitors. Head there early morning or as dusk sets in to beat the crowds. 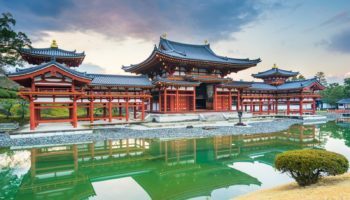 You’ll be able to get that perfect Japan travel brochure shot with all the orange gates stacked together like dominos and no tourists in sight. 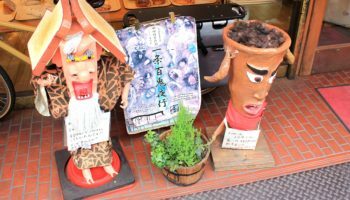 From Kyoto Station, take the JR Nara Line to Inari Station. It’s a 5 minute train ride and only two stops away. From Kyoto Station’s bus stop, take Kyoto City Bus South 5 (南5) to Fushimi Inari Shrine (approximately 13 minutes). Take the plunge at one of Kyoto's most iconic sights. Named after an actual philosopher, this streamside path inspires a zen state of mind. 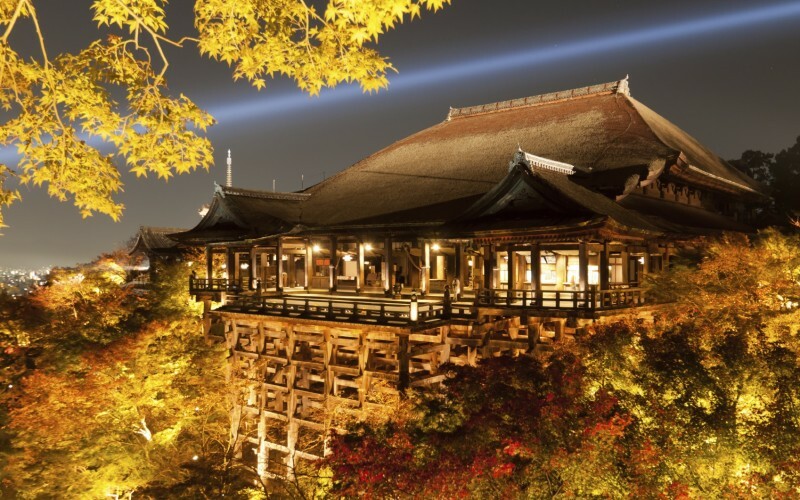 Don’t be fooled by Sanjusangendo’s austere exterior; concealed within these dark wooden walls are a 1001 statutes of the Goddess of Mercy, all built to human scale.